Gift Wrap is the new solo project from Brendon Avalos of the Brooklyn-based punk band B Boys. While B Boys sees Avalos drawing influence from the near in-exhaustible canon of punk, Gift Wrap is a love letter to 1980s industrial England. 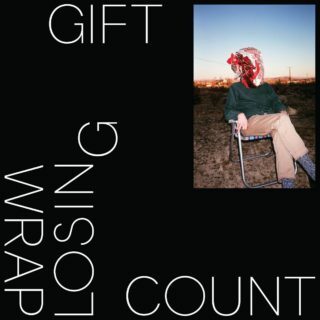 ‘Losing Count’ largely taking its inspiration from early Mute Records artists like Fad Gadget and Depeche Mode with a notable nod to the stark industrial futurism of Throbbing Gristle and Cabaret Voltaire. And while this album does manage to replicate these sounds rather successfully, it’s appeal is ultimately limited to those not already initiated into the world of early industrial and experimental synth-pop. Though these “stepping stone” records are appreciated, once the listener explores the source material, there is no need for them. Especially when they rely so heavily on their inspiration. For example, some of the guitar lines here are dead ringers for Bernard Sumner’s playing circa Joy Division/New Order crossover. It’s a style too often replicated. Despite this, there are some utterly excellent moments here; most notably the cover of Egyptian Lover’s ‘I Cry’. Although the idea of a cold-waved-up Egyptian Lover doesn’t sound immediately appealing, upon hearing it, it is clear that this needs to happen more. It comes at you out of left-field, hitting you square in the face. This shock and amusement is something that needs to be injected into the post-punk revival, which is still full of acts taking themselves woefully too seriously, ignoring the humour and transgressive nature of the music they are homaging. ‘Losing Count’ does do what it intended to in conjuring up images of the fabled murky industrial cities of the ’70s and ’80s – albeit with an American accent. However, it’s willingness to replicate rather than innovate unfortunately lets it down.